With all the thousands of people who travel to the USA for holidays and business there are now lots of US Dollars and cents that are brought back to the UK and never exchanged into Sterling. This is because UK Banks will NOT exchange low denomination currency and in particular foreign coins back into Sterling. This is down to the huge expense in counting, sorting and repatriating the currency. 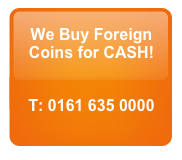 However, here at Cash 4 Coins we will exchange US Dollars and cents back into sterling for you. The service is very fast and simple – you package up your US Dollar notes and coins and post them to us, we count and sort them and e-mail you a valuation. If you are happy with this (you can decline and have the dollars and cents returned) then we will then pay you electronically into your bank account or PayPal account if you prefer – it really is that simple to exchange US dollars into Sterling. You can see our step by step guide to how it works on our web page ‘How to send us coins‘. It really couldn’t be easier for you to exchange US dollars and thanks to our many local drop off points, you can simply drop off your coins and leave us to do the rest. If your coin collection is over 10KG (you never know, it might be!) we will arrange for our secure courier to come and collect your coins from you absolutely FREE of charge! So why not see what US currency you have lying around. If you are lucky enough to go on many US business trips or holidays you are bound to have lots of coins and notes hanging around. Check in purses, suitcases, pockets and drawers and you’ll be surprised what you can find. In addition to our service for US Dollars we’ll exchange all foreign coins and currency. We’ll also change the old pre-decimal coins and well as the old British and Irish coins. We exchange coins for hospitals, schools, charities, clubs, businesses, airports and attractions – as well as for lots of private individuals looking to cash in their coins. Don’t try to change these coins up at your local bank because this is not a service they have to offer. Instead, send your coins to the experts at Cash4Coins and we will be happy to do the rest. We don’t even need you to sort or count your coins as we do that for you. Then, in a matter of days, you could have the exchanged money in your bank or PayPal account. That’s money that you might not have used otherwise. Many people will club together with friend and colleagues to organise a fundraising coin collection – and as we accept ANY NOTES AND COINS in any denomination or currency then you can turn those worthless coins back into cash! If you’d like to exchange US Dollars, cents or any currency then please contact us – we’d love to hear from you.